A couple of weeks ago, T Magazine published a feature on British interior designer Camilla Guinness. 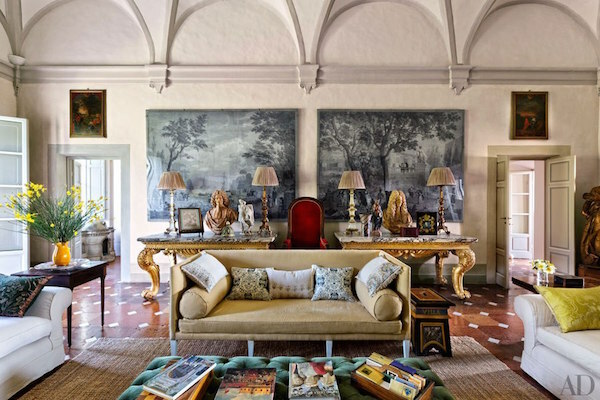 Known for her eclectic mix of English style with dramatic glamour, she created interiors for the likes of Isabella Blow and “an inner circle of bohemian Brits,” most notably, Ned and Marina Lambton, whose 17th century Tuscan villa she helped to restore. Her characteristic insouciant mix can be seen in the drawing room with grisaille panels over gilt consoles, simple linen upholstery and an Ikea rug. 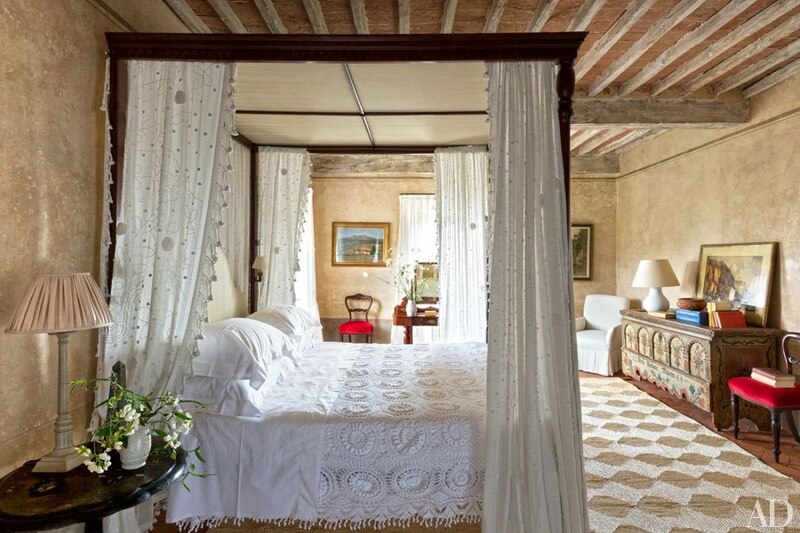 A charming guest bedroom includes Chelsea textiles bed hangings. Guinness is part of a creative family by both birth and marriage (her ex-sister-in-law is designer Rose Uniacke). Husband, Jasper Guinness, grandson of Diana Mitford, was part of Oxford’s gilded youth, eventually finding his way to Chianti. 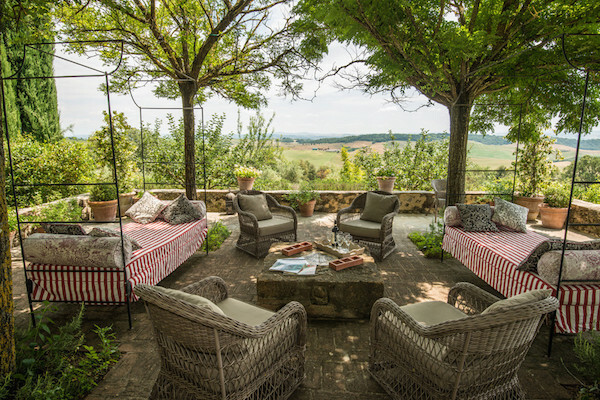 After marrying, Jasper and Camilla bought Arniano, a dilapidated Tuscan farmhouse that they lovingly restored and where he found his ultimate calling as a horticulturist and garden designer. Although Jasper died in 2011, Camilla still owns Arniano and, since much of this summer has been devoted to travel, I thought you might like to have a peek at this paradisiacal destination which is available to rent. 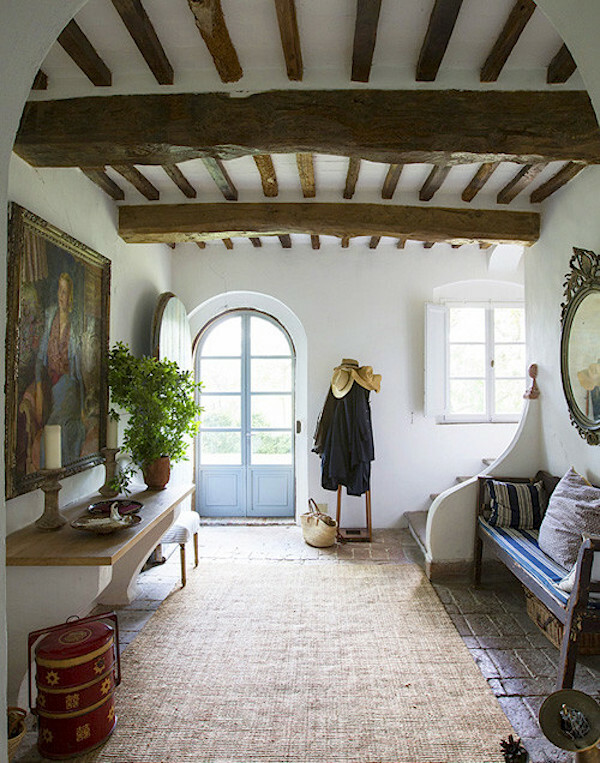 The interiors strike just the right note of British country meets Tuscan tradition. 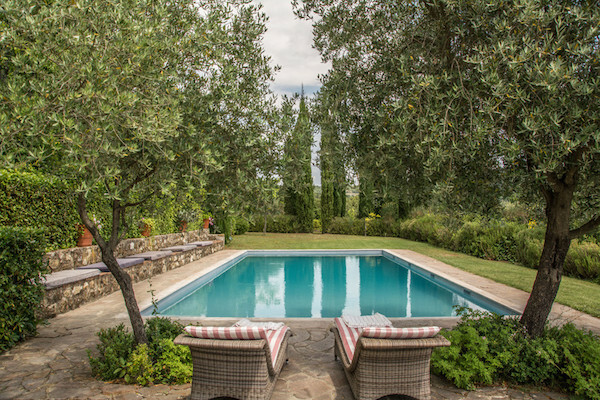 Approximately twenty minutes southeast of Siena, the villa is the essence of casual chic. 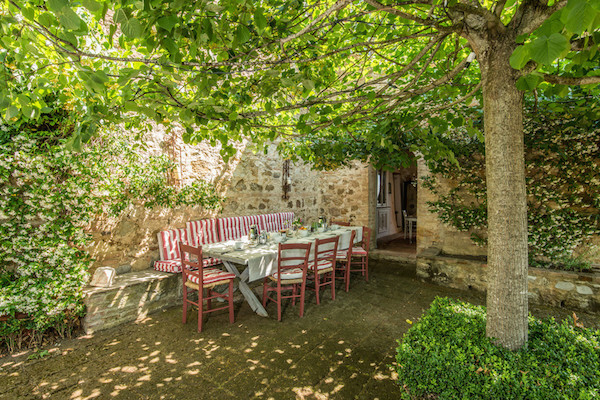 Beautiful views encourage days of lounging on the terrace or by the pool, perhaps sampling the local wines. to a well equipped kitchen to test the local fare. 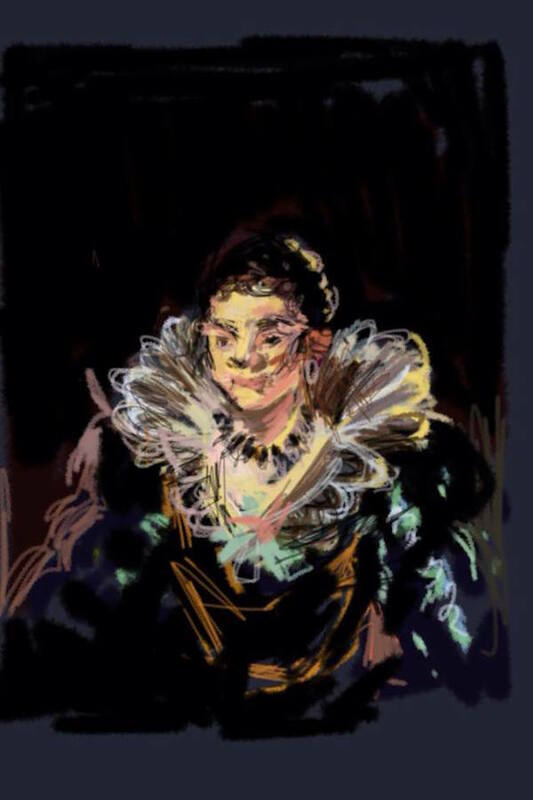 If you are looking for more cultural stimulation, Camilla’s daughter Amber and friend, artist Will Roper-Curzon run the Arniano Painting School, offering courses in April based at the Villa. 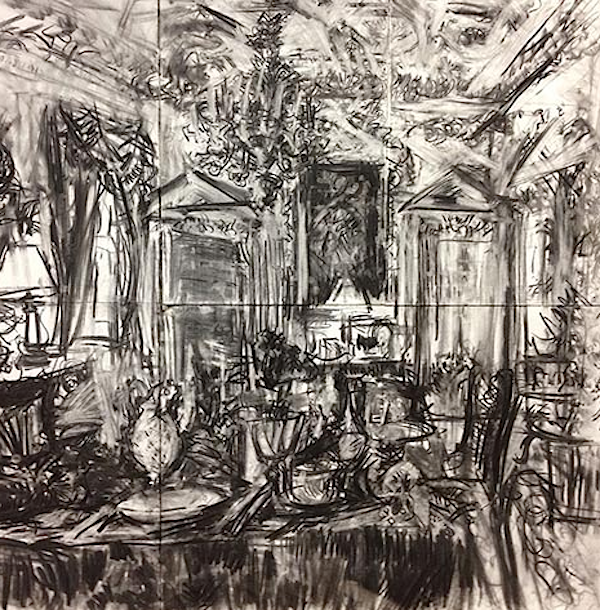 William trained at City and Guilds of London and the Prince of Wales’s Royal Drawing School, has been artist in residence at Dumfries House as part of the Prince’s Trust and has exhibited in many galleries in Paris and London. 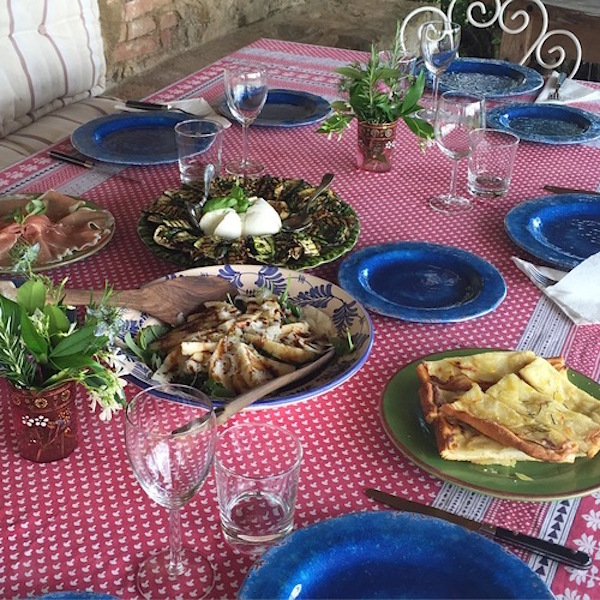 Amber provides the sophisticated sustenance, specializing in Tuscan cuisine, based on the highest quality of local ingredients. served in the most beautiful setting. 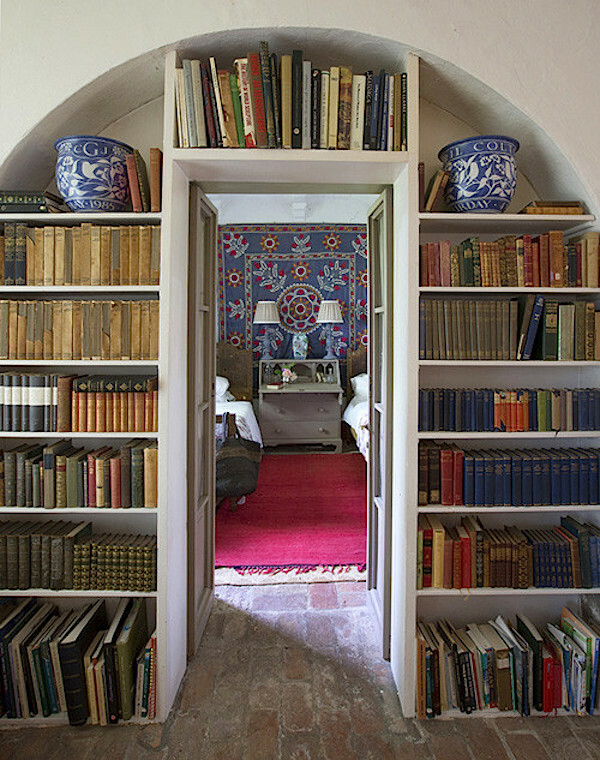 But no matter why or when you go, you will be visiting a home filled with history and love. This entry posted in food and drink, interior design, travel. 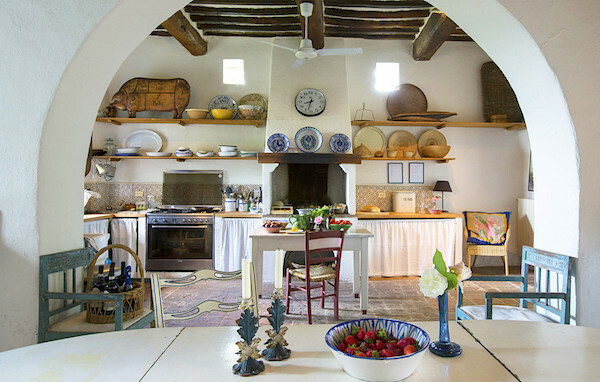 Entry Tags: Camilla Guinness, Italy, Travel, Tuscany, villa to rent Bookmark the permalink. oh dear… the temptation… Quite fabulous!! Thank you Stacey! 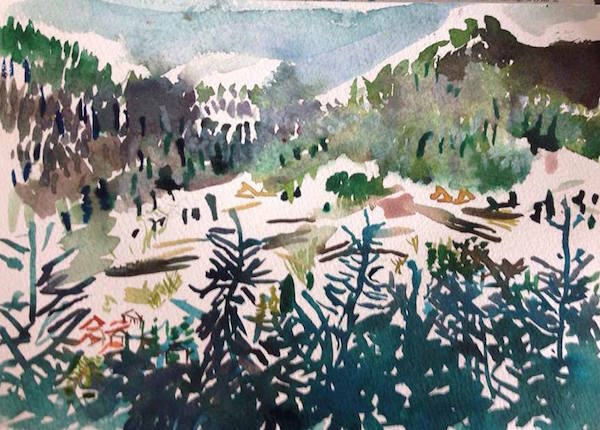 Spend some time here learning to paint? Yes, sign me up! Stacey, the property, home, provenance and then an art school founded by Camilla’s daughter and friend! Fascinating! Adore the grisaille panels in the living room!! Gorgeous. What an incredibly talented family. You must be related somehow. Absolutely stunning! 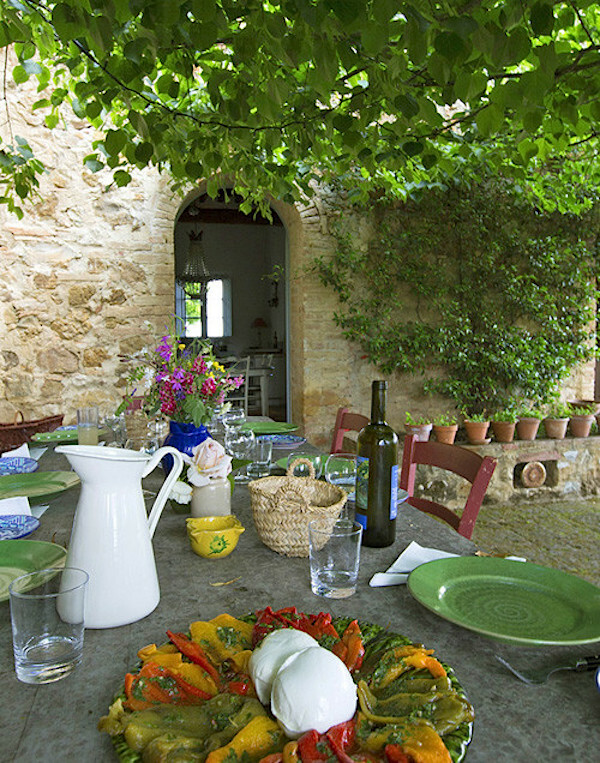 What a wonderful trip we had to Tuscany today! Will somebody feed me that fabulous looking food? Will I get to cook in that wonderful kitchen? You certainly will be feb like a king! 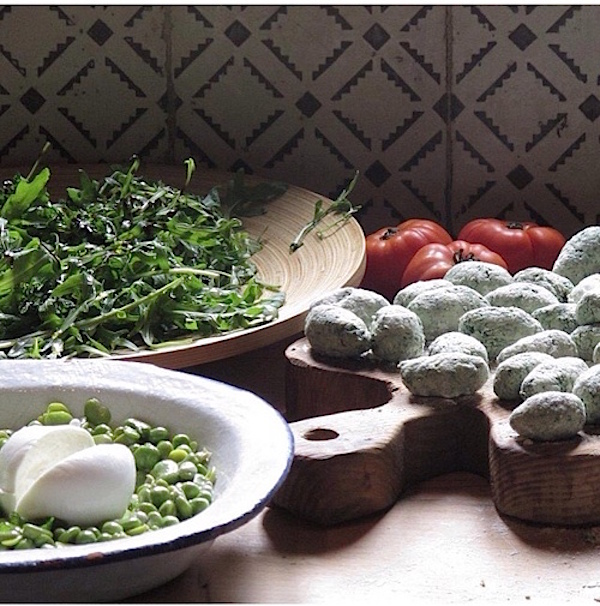 I cook a variety of typical Tuscan fare using delicious locally sourced seasonal ingredients! I was trained by my mother Camilla, who used to cook at the River Cafe in London. And we offer cooking classes for anyone who is keen to get in the kitchen! Here is my direct email address if you would like more information! Tempting ! Could you please quote the prices. Tempting indeed! I am not the owner of the villa. Please click on the highlighted “available to rent” phrase in the post. We think this would be a great place for a blogging reunion – and we’ll be the first to sign up. What a beautiful home and gorgeous views! We hope you’re enjoying these last days of summer, Q.
I hope this message reaches you. 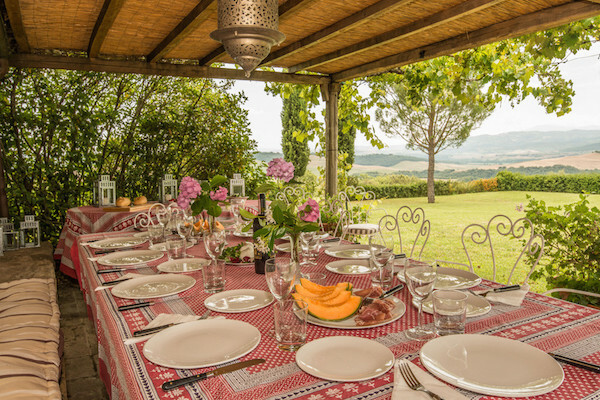 Mary and I have just had the good fortune to be able to take Villa Arniano for a couple of weeks so that we might give a holiday to our sons, their friends and a bunch of ours. We had a wonderful time thanks to your brilliance at creating the most relaxing of spaces (inside and out), your almost intuitive attention to detail (when one wanted something there it was), combing with some of the most sublime views of the countryside. On top of which your staff were not only brilliant at their jobs but wonderful to spend a holiday with. I know when we have people passing through it is nice to know who they are. We were at various times Nick Wilson and his wife ( Supreme Court). Stephen and Flo Bayley (cultural commentator and journalist), John Martin Robinson (architectural writer etc), James Holloway ( National Portrait Gallery, Edinburgh), Denis and Denise Blakeway ( TV company), Alistair and Becky Hicks (Purdy Hicks Gallery). James and Kate Hamilton ( authors) plus Tom. Mund and Bart Miller who seem to know Amber – small world.